Hi-Protein Matrix (Isolated Soy Protein, Whey Protein Concentrate (Milk), Hydrolyzed Protein), Glycerine, Coating (Maltitol, , Cocoa Butter, Chocolate Liquor, Sodium Caseinate, Milk Fat, Soy Lecithin, Vanilla, Natural Flavor, And Salt), Water, Maltitol, Peanut Butter, Polydextrose, Corn Syrup, Reduced Fat Peanut Flour, Natural Peanut Flavor, Potassium Sorbate, Vitamin Blend (Niacinamide, DL-Alpha Tocopheryl Acetate, Ascorbic Acid, Biotin, Pantothenic Acid, Vitamin A Acetate, Phytonadione, Pyridoxine HCL, Riboflavin, Thiamin Mononitrate, Cholecalciferol, Cyanocobalamin, Folic Acid), Almonds. Hi-Protein Matrix (Isolated Soy Protein, Whey Protein Concentrate (Milk), Hydrolyzed Protein), Glycerine, Coating (Maltitol, , Chocolate Liquor, Cocoa Butter, Milk Fat, Soy Lecithin, And Vanilla), Water, Maltitol, Polydextrose, Cocoa, Corn Syrup, Partially Hydrogenated Vegetable Shortening, Natural And Artificial Flavors, Potassium Sorbate, Vitamin Blend (Niacinamide, DL-Alpha Tocopheryl Acetate, Ascorbic Acid, Biotin, Pantothenic Acid, Vitamin A Acetate, Phytonadione, Pyridoxine HCL, Riboflavin, Thiamin Mononitrate, Cholecalciferol, Cyanocobalamin, Folic Acid), Acesulfame Potassium, Peanut Flour, Almonds. Hi-Protein Matrix (Isolated Soy Protein, Whey Protein Concentrate (Milk), Hydrolyzed Protein), Glycerine, Maltitol, Coating (Maltitol, Cocoa Butter, Chocolate Liquor, Sodium Caseinate, Milk Fat, Soy Lecithin, Vanilla, Natural Flavor, And Salt), Water, Polydextrose, Natural And Artificial Flavors, Vitamin Blend (Niacinamide, DL-Alpha Tocopheryl Acetate, Ascorbic Acid, Biotin, Pantothenic Acid, Vitamin A Acetate, Phytonadione, Pyridoxine HCL, Riboflavin, Thiamin Mononitrate, Cholecalciferol, Cyanocobalamin, Folic Acid), Peanut Flour, Almonds. First there was the "energy bar." This was followed by the "high protein" bar and then the "low carb" bar. With the Hi Protein Bar, a new precedent has been set: the high protein/low carb (HPLC) bar. Hi Protein Bar is our HPLC bar with 32-34g of protein and only 7g of net impact carbs, with a protein-to-carb ratio of nearly 5-to-1. 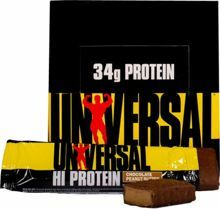 For starters, the Hi Protein Bar tops the scales at 85g. And while many bars use only whey protein concentrate, Hi Protein also uses the purer, more expensive whey protein isolates in each and every bar. Plus, you´ll also find hydrolyzed whey protein, glutamine peptides, and soy isolates. But protein is only part of the story. Compare Hi Protein Bar's 1g sugars to others. Some "high protein" bars contain 13g of sugars! We make all of our own bars. We don´t hire a "contract manufacturer" to do it for us. Ever wonder why nearly all bars taste the same? That´s right, contract manufacturing. Does the back of your high protein bar say, "made by" as it should, or does it say "made for" or "distributed by"? This is an important distinction. Manufactured by us. More protein, fewer carbs. What more do you need to know? How about a nice, easy price? Because we´re the manufacturer, we can keep quality up and cost down. 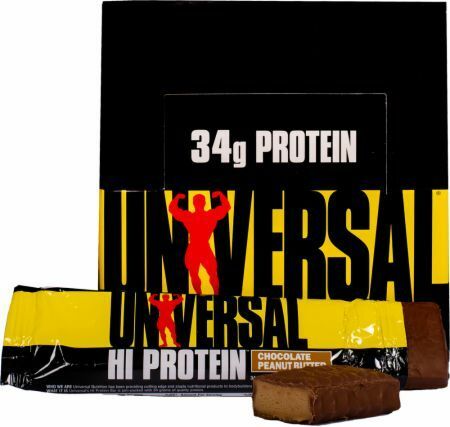 On a gram per gram basis, Hi Protein Bar is our most economical of all the bars. Finally, while protein content may be the primary concern, and while the price is secondary, there´s still the issue of taste. A bar can be great in every respect, but without taste, it will never succeed. Some bars on the market have the consistency of asphalt. Others taste like they´re made of concrete. Rest assured, all of the Hi Protein Bars are soft, moist, fresh and delicious. With 20 key vitamins and minerals and its proprietary Hi Protein Bar Matrix, the Hi Protein Bar is extremely hard to beat.